I hope you all had a Merry Christmas! It’s the end of another year and time for a “year in review” type post on Roadtrip-'62 ™. This was the first year that we traveled down multiple highways, instead of taking a long multi-year trip. Chances are good that we traveled to someplace near you, and chances are good that we traveled to someplace you’ve never been to. Though, after I looked through the list below, I realized that most of the trips have been out east. So, next year Roadtrip-'62 ™ will try to head west more often! We began the year with the first journey Roadtrip-'62 ™ ever took on a three-digit highway, US-223. This was a natural side trip from our US-23 trip, and is our shortest trip at just 56 miles, from near Somerset, Michigan to Toledo, Ohio in 1962. It is scheduled to someday be replaced by I-73, but for now it has only been shortened by 6 miles near the Toledo end. Speaking of Toledo, it’s a great place to begin a roadtrip because in addition to US-223, highways US-20, US-23, US-24, and US-25 all pass through town! Next up saw us on route US-10, which we did in two parts. Early in the year we looked at Ludington, Michigan, the east end of a ferry that carries the route across Lake Michigan. Later in the year we ran over to the Manitowoc, Wisconsin end of the ferry. 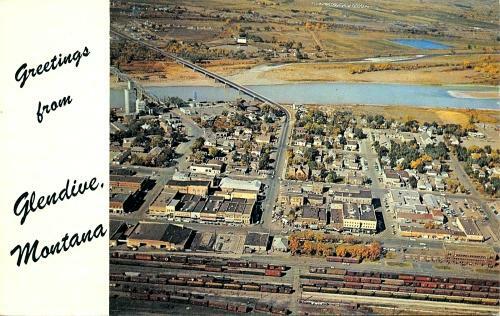 If we had continued west to the end of US-10, we would have passed through Glendive, Montana. Today, it’s the site of the Glendive Dinosaur & Fossil Museum, and there was a museum display of dinosaur bones in town even in 1962. The Museum is unusual in that it displays dinosaur reconstructions in the context of the Bible, instead of in the context of geological science. I then turned to the most northerly of the US-numbered routes, following US-2 through all the National Parks and other national recreational lands along the way. There were so many sites, it took two posts to mention them all! Highway US-2 also meets highway US-10…all roads lead to Spokane, Washington. 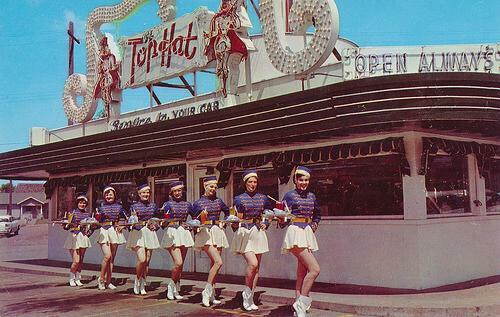 There, we could have been served dinner in our car by the girls at the Top Hat Drive-In. Between some of these other trips, we looked more 3-digit routes. On US-202 from Wilmington, Delaware north, we saw Revolutionary War sites and crossed the Appalachian National Scenic Trail. On US-176, we traveled from the South Carolina coast northwesterly through the state, where saw new freeway construction and learned some history of desegregation in 1962. Seastack rock formations on the Pacific Ocean coast of Oregon. We also stopped in Boston, Massachusetts, which like Toledo, hosts several US-numbered routes. Highways US-1, US-3 and US-20 all pass through town. In fact, they have US-20 in common. Route US-20 is now the longest US-numbered route, since US-6 was shortened by California in the late 1960s. It ends at Newport, Oregon, in the midst of scenic Pacific Ocean beaches. A few weeks after the Boston trip, we took a longer look at US-1, starting near its northern end in Maine and making stops all along the way. We stopped in places as diverse as Roosevelt Campobello International Park at the Canadian border, a brand new Holiday in at Attleboro, Massachusetts, shopping centers in Baltimore, Maryland and Ft. Lauderdale, Florida, and rode the newly automated subway line to see one of the first home games of the New York Mets in New York City. All while avoiding the freeways that were just being opened along the route! After that, we drove all over the New England area, seeing sights along US-3, US-4, US-5, US-7, and US-9. That took three separate posts to cover! We started at the border with Quebec, Canada, where we tried to catch a glimpse of their local Loch Ness type monster, Memphre. Then, we grabbed some maple syrup candies while visiting a marble quarry, and saw some historic homes along the Hudson River in New York state. I took a trip on part of US-8 in Wisconsin also, where we found a good northwoods pasty for lunch, visited some waterfalls other scenic river sites. Route US-8 also continues west, crossing US-61 near its end in Minnesota. Highway US-61 is also known as The Great River Road, as it parallels the Mississippi River, which I’ll try to write about next year. And, to close out this year, last week’s post covered part of US-11 in Tennessee, with visits to both Revolutionary War and Civil War sites. Of course, many of these routes crossed our first two roadtrips of US-23 and US-6, so we could revisit sites along them. Of course, besides driving around the United States, there were other posts discussing everything from world news of 1962 down to national news, local news, science news, sports, and even the weather. I took a look at the Boy Scouts, some more Ed-U-Card games, stamp collecting, TV shows, cars, toy guns, and even Holiday Inns. You can find the whole list of posts on the Blog Archives Page. Just in case you were worried, though it’s the end of the year, it’s not the end of Roadtrip-'62 ™. It’s always 1962 here and we’re always on the road, so I’ll see you again next year with more fun places and more news from 1962! Meanwhile, enjoy the 1962 Christmas / New Year’s party below and thanks for reading! The Rough & Silk Families Christmas / New Years Party in Romford, United Kingfom, 1962: the Twist, the Limbo, what more could you ask?